Santa Maria’s largest private employer, French-owned Zodiac Aerospace, will lay off 168 workers on June 22, according to a state notice published this week. 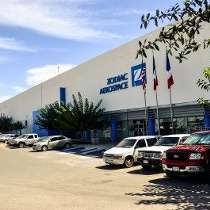 The company employs about 1,800 workers in Santa Maria. For the first nine months of the fiscal year, Zodiac Aerospace revenue in the seat division was down 4.2 percent. In a March financial report to its shareholders, the company voiced concerns with the Santa Maria operation. “The recovery and industrial transformation plans for the seats branch are proving long and costly, especially at its seat-shell manufacturing site at Santa Maria, California,” the report says. Zodiac Seats U.S. is one of the world’s top manufacturers of commercial aircraft seats for airlines and commercial aircraft manufacturers. Its headquarters and primary manufacturing facility is located in Gainesville, Texas with final assembly lines located in California and China and a component manufacturing facility in Mexico. The Santa Maria division specializes in passenger seats for regional aircraft manufacturers. Calls to the corporate office in Huntington Beach were not returned. You’re right lets elect an insider that has been taking dollars from big corporations, wall street, and foreign interests her entire adult life…. Vote for real change, elect a businessman for a real change. I’ve had enough of lawyers and career politicians. Make America Great Again! VOTE TRUMP! If it were not for federal assistance the food lines would be 10 miles long. This isn’t a recession it’s a depression and the people are being misled about the national debt. We are broke so you can keep doing and voting the same way and watch as nothing gets better….Go ahead make fun of Trump and gag all the way to the poor house. 20 Trillion and rising….Obama will fix it…Gag me! We could vote of or an insider who is influenced by corporate dollars, or for an outsider that has used his big corporate money to influence government. Or, we can take a second look at Bernie. Those are our three choices. It’s a French company. I wonder how the French feel about farming out their jobs to cheap labor in California?